COLORADO SPRINGS – Major aerospace corporations such as Lockheed Martin and Aerojet Rocketdyne are developing greater 3-D printing capabilities as a way to speed production and lower costs. Speaking to reporters during the 33rd annual Space Symposium last week, both companies said they are expanding the number of components they manufacture via 3-D printing, more formally known as additive manufacturing. “The advantage that additive [manufacturing] typically provides is not only reduced cost, but it’s really reducing the span time,” said Brian O’Connor, Lockheed Martin Space Systems’ vice president of production. One example he provided was a spherical titanium tank, comprised of two domes 117 centimeters in diameter, used on one of the company’s A2100 satellite buses. With 3-D printing, manufacturing time has dropped by two-thirds, he said. “This allows us to cut that span time down from 18 months to go get a tank down to a neighborhood of less than 6 months,” O’Connor said. The 3-D printing also allows Lockheed to create greater custom designs for satellites and satellite parts to meet specific functions, without needing a huge amount of capital to retool manufacturing capabilities. Lockheed said it is planning to use additive manufacturing on a military satellite for the first time. For the next Air Force Advanced Extremely High Frequency satellite, AEHF-6, the company built a remote interface unit, which the company describes as “an aluminum electronic enclosure designed to hold avionic circuits,” using 3-D printing. Manufacturing time went from six to one and a half months, and the assembly time dropped from 12 hours to just three, the company said, adding that the effort will serve as a model for using similar techniques on other A2100 buses. NASA’s Juno spacecraft, currently orbiting Jupiter, launched in 2011 with Lockheed’s first 3-D printed parts: a series of eight titanium brackets. The company is also exploring applications for 3-D printing beyond satellites. Lockheed said it’s looking at manufacturing parts that could be included on rockets. Another company is already using 3-D printing for rocket engines. Aerojet Rocketdyne announced April 3 that it successfully test-fired a full-scale 3-D printed copper thrust chamber assembly for the RL10 rocket engine. 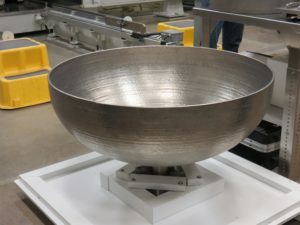 Creating the thrust chamber takes just under a month, the company said, and reduces the part count by more than 90 percent over the current design that uses multiple stainless steel tubes. Aerojet is now looking at implementing similar 3-D printing techniques for its RS-25 engine that will be used on NASA’s Space Launch System, and the in-development AR1 engine that the company is hoping will be selected to power United Launch Alliance’s Vulcan rocket.